When Will A Female Superhero Get Her Own Movie? When it comes to superhero and sci-fi films, rumors are everywhere and it's hard to tell fact from fanboy dream. Like, remember a while back we said that Marvel Studios president, Kevin Feige, suggested that a Black Widow movie starring Scarlett Johansson was in the works? This may not be the case anymore. In fact, we're hearing that there won't be a Marvel Studios-created film with a female lead until at least 2018. This is our disappointed face. As of right now, Marvel and the other studios it works with have a glut of superhero films in development. In addition to this year's Captain America: The Winter Solider, The Amazing Spider-Man 2, X-Men: Days of Future Past, and Guardians of The Galaxy, projects like The Avengers: Age Of Ultron, The Amazing Spider-Man 3 and 4, Captain America 3, X-Men: Apocalypse, Ant-Man, and a new Fantastic Four are all in the works. There's also strong talk about flicks starring Doctor Strange, a new installment of Wolverine, more Thor films, and, of course, Avengers 3. At this rate, Marvel Studios, alone, is targeting four new films a year. That's a lot of explosions! And, yet, none of the upcoming projects focuses on a female superhero. Yes, many of the above feature strong women. Those women, however, are part of male-dominated teams. This trend is highly disappointing, and not just because of the basic issue of equal representation. One of the biggest reasons for Marvel's recent success is the fact that most of the films have crossed over from your typical sci-fi fandom to a broader audience. That means: women turning out en masse. Male viewers, as well, have embraced characters like Scarlett Johansson's Black Widow, Thor's Lady Sif, Jennifer Lawrence's Mystique from the X-Men franchise, and so on. It's easy to take this as the market's loud-and-clear desire to see a female-led film. And, it's not like comic books are short on possible candidates (She-Hulk, Captain Marvel, Ms. Marvel, DC's Wonder Woman, and so on). Before we even get into the progressive ethics of sending up a woman-starring flick and seeing what happens, there are clear business reasons to try it out. Too bad, that doesn't seem to be happening any time soon. There is, however, some good news on this front. Click over to the next page for more. "I'm very proud of the way the Marvel movies handle the female characters who are in all the movies we are making, as opposed to feeling the pressure of 'When are you doing a female movie?' We're exploring a lot of Widow, and that's going to continue with Age of Ultron in a big way." He went on to say, "I like the idea, if we're going to do a [female lead], to do a new one. Do a wholly new character, do an origin story...We've talked a lot about [Captain Marvel]. I think that would be very cool." At worst, he throws an "if" before the concept of tossing a lead role to a woman. But, he at least seems interested..
More excitingly, the image above shows that Marvel is taking a smart approach toward the design of its latest female character. 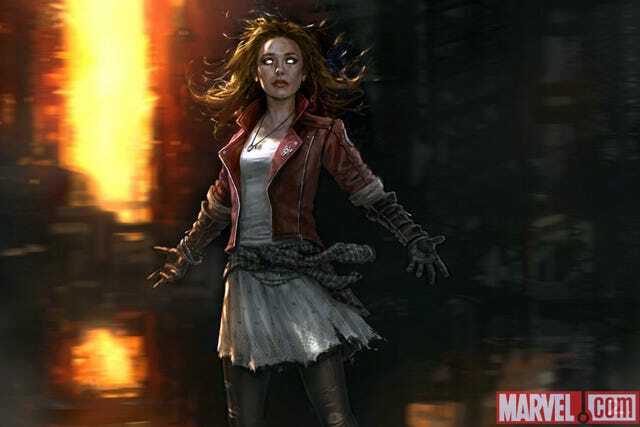 The Scarlet Witch of Avengers Age of Ultron, played by Elizabeth Olsen, will forgo the sexualized, somewhat absurd getup of the comic books. Instead, she'll be decked out in leggings, a simple dress, and a boss red-leather moto jacket. Sure, it still lands well in the territory of fanboy eye candy, but there's not a bustier in sight. Finally, we've got Kate Mara starring in the Fantastic Four, Jennifer Lawrence likely returning for another X-Men installment, and Black Widow's big show in The Winter Solider. On the TV front, the continuing Marvel's Agents of S.H.I.E.L.D. features exactly as many female series regulars as male. As well, there's the upcoming Jessica Jones Netflix project.